The names are not clear on the graves. There is little time for families to find the graves of family and friends who died of Ebola. 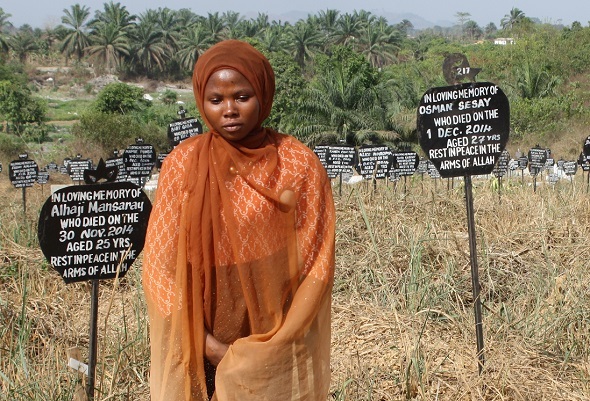 Mariama B Jalloh tells the story of looking for her father’s grave. Ebola destroyed my family. When I heard my relatives were sick, I was in Makeni, a day’s journey away from my village, Kumala. At first I thought, let me go there, even if I die with them. But travelling was not allowed, so I could not go. I stopped eating. I thought I was going to be the only person left. Ebola killed my father and 26 other relatives. He died on 9 November 2014 – there were few treatment centres then, so they took him hundreds of kilometres to Bo. My father loved me so much since I was little. I was his eldest child. I caught polio when I was a baby and that made my mother ashamed of me. When I was young, she used to beat me and throw me outside. My father protected me. He was a big family man. He was 40 when he died, and he had four wives and 21 children. The only thing my father and I did not agree about was education. He didn’t think that girls should go to school. But I asked the leaders of my village about it. I believe education is so important, especially for disabled people – it means you can get a job, you can be independent. We can’t do physical work like digging and planting. The elders put pressure on my father. He allowed me to study, but he said he would not pay for it. He believed that when Sierra Leonean children get educated they will not respect their families, they will not work on the farm or help cook; they will think they are kings and queens and not serve God. I became independent. I made money from hairdressing to buy my uniform, and because I came top of my class, my teachers also fought for me, and later I won a scholarship to continue. Later, my father changed. He was trying to go on a hajj to Mecca. And this had made him understand how importance education is. He couldn’t read or write, or speak English, and a brother (the only educated person in our family) did everything for him. Before Ebola, they were preparing to go. He came to Makeni and promised me that when he returned from Mecca, he would help me to finish my education. But then he died. When my father died so far from home, my family felt great pain. When my father was buried, there was no respect for victims of Ebola. They did not bury him with respect – a big family man like him! My family cried a lot. We did not want my father to die like this. My brother said he would come to look for my father, when he had the money. But until now, 18 months after his death, he does not have enough money to come. We were also afraid we would not be able to find him. When On Our Radar came with New Internationalist, we travelled together to look for my father’s grave. We got a copy of the death certificate with the number 187. The council said this number was on his burial place. But when we got there, we saw that it was not organized. All these people were just buried with sticks. You could not read many of the numbers. We began to search, but there were so many graves there. We searched for hours. It felt like a disaster. I nearly lost hope. Then we saw some gravediggers who helped us – they remembered where they had buried him, from the date of his death. My heart was telling me it was around this one area. That’s why I stayed looking around there. I found sticks that seemed to have similar numbers but not his. And that is where we found him in the end. That shows that maybe my father was directing me. I felt that he could hear me and he was crying also. I felt closer to him, I felt he could see me. Even now, I feel he is with me. The next day, we brought a permanent sign with his name. I was able to say the prayers that you must say when a Muslim dies in Sierra Leone. I blessed him 10 times in Arabic and that blessing will go direct to him. I asked God to take care of him, the way my father took care of me when I was small. My father died alone here, so the marker they gave him was not good enough. And it’s the same for most of the people who died here without family. Most of the sticks in the graveyard have already faded or fallen down. Only the people with family in Bo got the proper markers. I feel better now I have seen his grave. We have written a sign and placed a marker there. We cleaned around the area. Now that I have identified him, my family can come. I took photos of everything – the stick, the grave. I want to show my family everything exactly as it was. They will be proud of me – especially a disabled person like me; they wouldn’t expect it. I feel happy that it was me that found my father’s grave. When they come, they will not have to suffer, like I did. Watch this story here on Back in Touch : https://backintouch.org/ There are 8 stories about love and loss in the time of Ebola in Sierra Leone. (This article has been simplified so the words, text structure and quotes may have changed). This page was last edited on 3 June 2016, at 10:03.